There is widespread agreement on the need to ensure that REDD programmes positively engage with indigenous peoples and forest communities. The need to promote the full participation of indigenous peoples and respect territorial rights is enshrined in international human rights agreements, while preserving their ability to access forest resources can strengthen the ability of indigenous peoples to adapt to climate change. Forests, and the ecosystem services they provide, are critical to the livelihoods and wellbeing of forest-dependent communities. Positive forest management therefore has the potential to help advance the sustainable development and empowerment of indigenous peoples; where REDD programmes are implemented without sufficient local participation and with a disregard for indigenous rights, however, they can further marginalize and alienate local forest custodians. The workshop was opened by Claudio Schneider, Technical Director of CI-Peru, and Adalberto Padilla of IUCN Mesoamerica, who outlined the central tenets of stakeholder engagement in REDD: the need for consultation and information-sharing; respect for access rights; secure resource tenure; equitable benefit sharing; and respect for the values and world view of indigenous peoples. Claudio then introduced the first session, which focused on the case of stakeholder engagement in the San Martín region of Peru. The government of Peru recently enacted the Consultation Law, which was drafted under the guidelines established by Convention No. 169 of the International Labour Organisation (ILO). This law recognizes the right of indigenous peoples to prior consultation of any legislative and administrative measures that directly affect their collective rights of physical existence, cultural identity, quality of life and development. The regional government of San Martín, along with Conservation International-Peru and Amazónicos por la Amazonía (AMPA), has conducted stakeholder engagement processes that aim to contribute to the enactment of these new regulations for the benefit of vulnerable forest-based groups by developing and applying safeguards under REDD+. Sylvia Reátegui, Head of San Martín's Regional Environmental Authority, set the context for sustainable forest management in this critically important region of Peru. Migration to the area in recent decades has led to high population density around San Martín's valuable watershed areas, threatening the ecological integrity of its forests. REDD presented itself as an opportunity to bring about benefits for conservation of the region's forests and for its native communities. Sylvia emphasized how working directly with forest communities in implementing REDD programmes had allowed for improved dialogue and closer collaboration between government authorities and these previously marginalized local stakeholders. 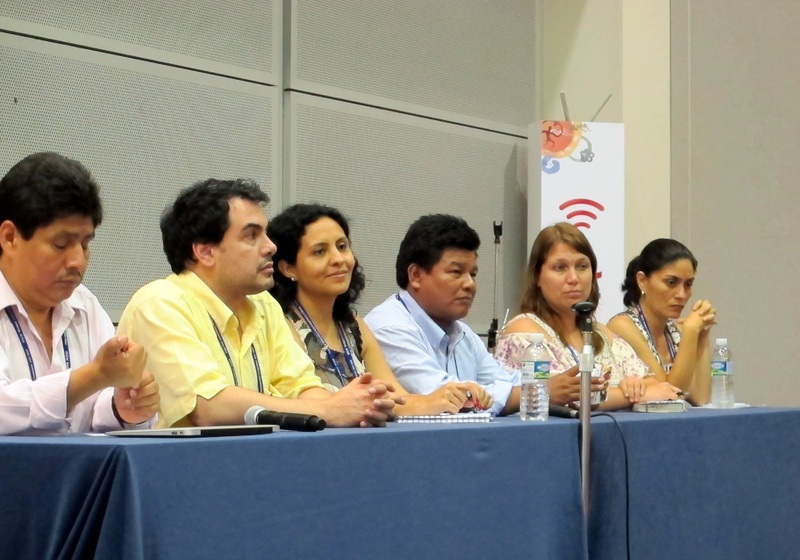 A "REDD Roundtable" involving representatives of the regional and national government, along with civil society, including San Martín's forest communities, has enabled the establishment of a baseline for resource access needs and priorities within the region. Challenges remain, however, for this relatively new process in San Martín, including determining the implementation of MRV requirements. Karina Pinasco Vela presented on the role of AMPA in supporting San Martín's native communities. This has included ecological mapping exercises, helping forest users to obtain forest concessions, and participation in a Regional Environmental Commission. Karina also highlighted the work of the Regional Office for the Development of the Indigenous Peoples of San Martín (Oficina Regional de Desarrollo de los Pueblos Indígenas de San Martín – ORDEPISAM) in providing crucial capacity building for indigenous peoples' representatives, enabling them to play a role in regional government. 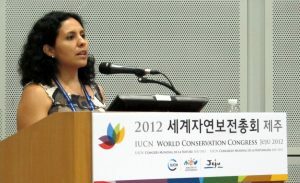 Milagros Sandoval (CI-Peru) presented on Conservation International's work in evaluating the successes and challenges in implementing REDD safeguards and stakeholder engagement. Analysis at the project, regional, and national levels revealed that issues such as the time it takes for local stakeholders to realize benefits from REDD programmes can be an obstacles to their acceptance. Similarly, the real costs of participatory processes are not often taken into account: dialogues that take place at the national level often involve long distances for community representatives to travel. Requests were made for more efforts to share information and support capacity building. Stakeholder mapping, conflict resolution over resources, and establishing land rights are important processes in preparing often diverse local groups for REDD implementation. Once implemented, these processes need to be monitored on a continual basis, and also need to find sustainable sources of funding. Based on these results, CI-Peru has held a series of workshops focusing on capacity building for REDD, and has developed 'training for trainers' guides for indigenous and local representatives to take back to their communities. Other cases to be presented included the Paraguay Forest Conservation Project, being implemented by the NGO Guyra Paraguay (a partner of BirdLife International) in two areas of Paraguay: La Amistad, in San Rafael, and in Chaco, in eastern Alto Paraguay. This project, with the support of the World Land Trust and Swire Pacific Offshore, allows local community members to improve their farming systems and general wellbeing and safeguard the forest under their control. José Luis Cartes presented on behalf of Guyra Paraguay, describing the lessons learned from the project in the campesino community of La Amistad. The project comprises a strip of 1,182 ha penetrating into the heart of the forest, part of the once-vast Atlantic Rainforest, now the world's most critically threatened biodiversity hotspot. Approximately half of the land held by La Amistad small-holder community members remains forested. Given the low incomes of the farmers, the incentive to clear forests for cultivation is extremely strong. The project in San Rafael has therefore sought to provide incentives for forest conservation. In return for voluntary participation, with community members opting to contribute forest parcels to the community forest reserve, farmers will benefit from direct payments and services provided by an agricultural extension programme funded by REDD payments. The programme in San Rafael could safeguard a minimum of 800,000t of CO2 equivalent over a 20 year period. After a three-year process costing more than USD 1 million, the San Rafael project achieved verification of its community, carbon and biodiversity effectiveness and benefits from the Communities, Carbon and Biodiversity Alliance (CCBA). José emphasized that three years of negotiations with donors, plus the ten-year timeframe before interest payments from the trust are made to the famers, have made it difficult to maintain the trust of indigenous and farmer communities. Ramiro Batzín was next to present on the experience of the Indigenous National Roundtable on Climate Change (Mesa Nacional Indígena de Cambio Climático) in the REDD process in Guatemala. This initiative arose out of the need to strengthen the institutional rights of indigenous peoples, build their capacity, and better utilize indigenous knowledge for adapting to climate change. Existing policies at the national level on REDD fail to fully recognize indigenous peoples' rights, while mechanisms for FPIC are currently lacking. The initiative has therefore drawn up guidelines for safeguards in partnership with Conservation International, based on the rights enshrined in the UN Declaration on the Rights of Indigenous Peoples (UNDRIP) and the Convention on Biological Diversity (CBD). First, they propose the establishment of an indigenous people's fund concerning the management of forest in indigenous territories. 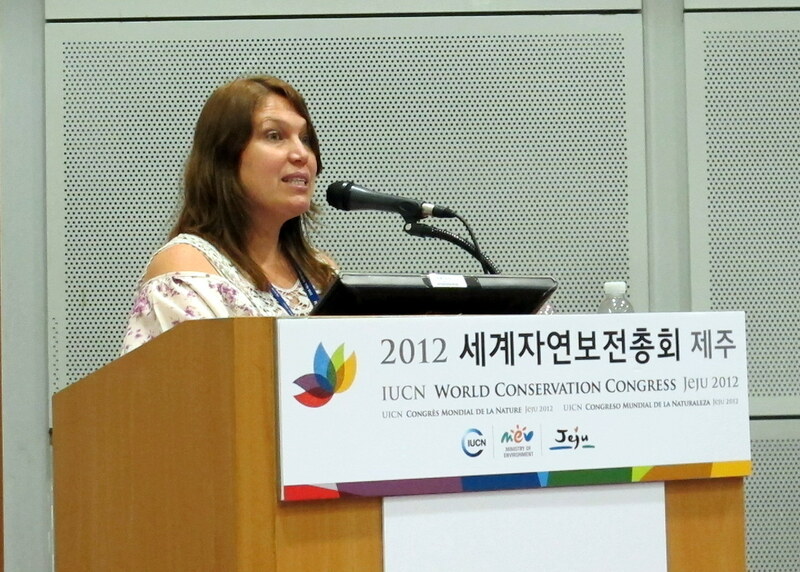 Second, they call for the creation of incentives for conservation among indigenous peoples. Third, they highlight the need for technology transfer and capacity building processes. 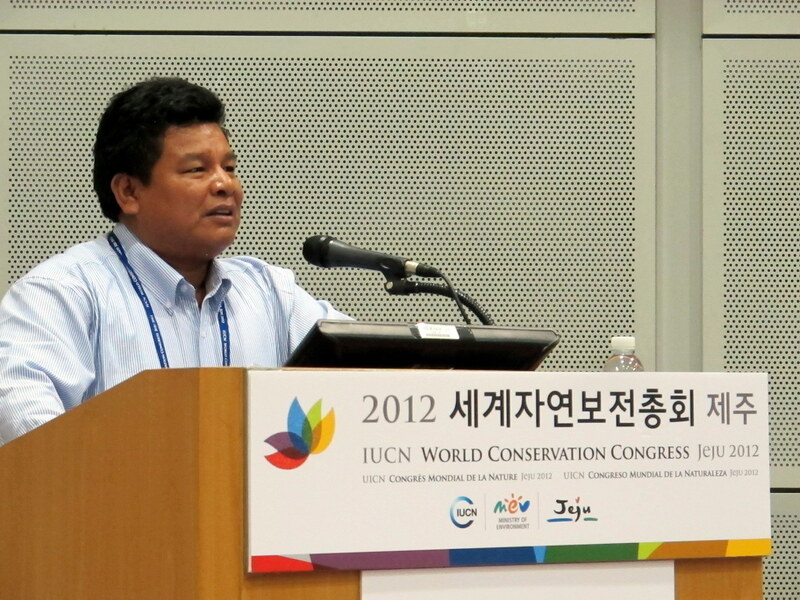 And finally, policies must support the use, management and conservation of forests in indigenous peoples' lands. The final speaker was Edwin Vasquez, a Huitoto Indian from the border between Peru and Colombia and the General Coordinator of the Coordinating Body for the Indigenous Organizations of the Amazon Basin (COICA). 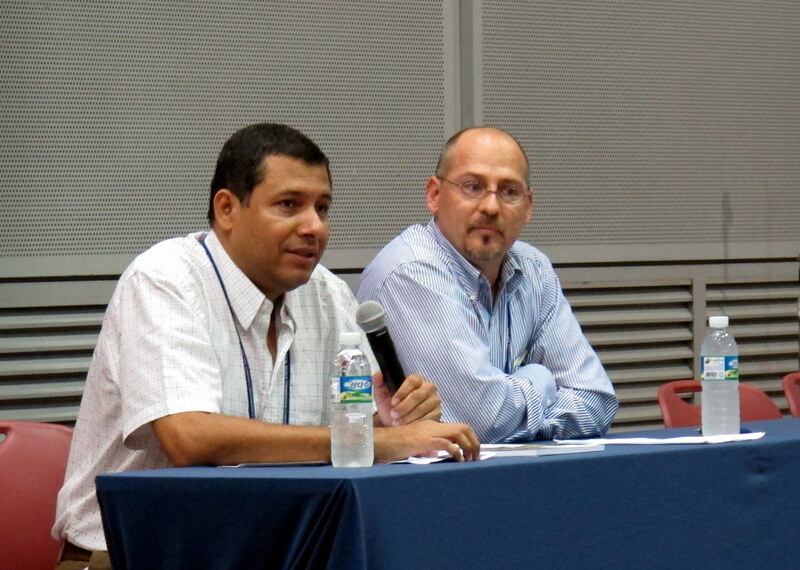 Edwin spoke about COICA's work in tracking the implementation of equitable FPIC arrangements in Amazon communities. Based on the experiences of local communities, COICA has voiced its fears that rights enshrined in the ILO Convention 169, UNDRIP, and the CBD are still being ignored in the design of fledgling REDD programmes. He highlighted the special dangers these programmes often pose to indigenous peoples in voluntary isolation: COICA proposes that these territories be fully protected from forest management programmes. He also called for an alternative funding model to financial mechanisms based on carbon markets, reducing the vulnerability of forest communities to exploitation by large companies. Reports on the implementation of REDD in forest communities must be taken on board – they can act as much-needed indicators on the extent to which participation is full and active. The workshop concluded with a discussion in which participants emphasized the need to see REDD as a means, not as an end in itself. 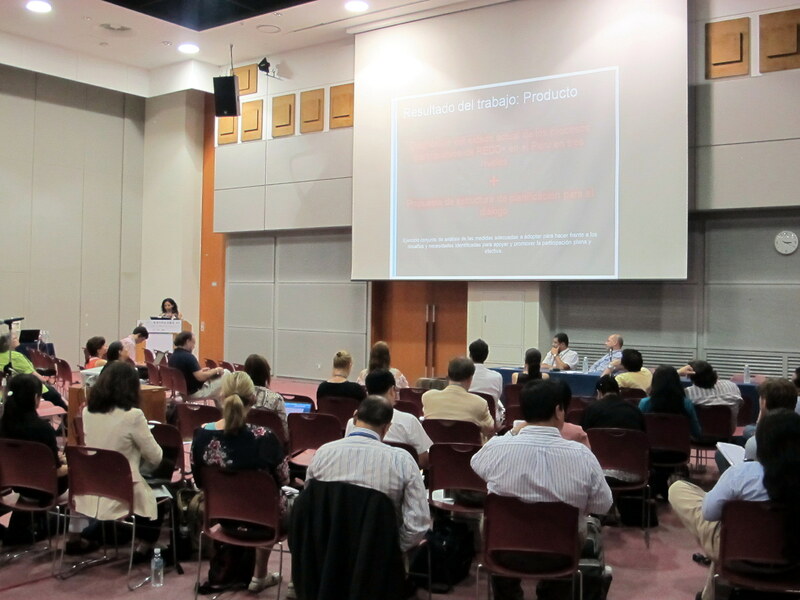 The design of REDD programmes presents new opportunities for local and regional stakeholders – for instance, those in San Martín – for sustainable development; a means for future green development. Seen positively, the design of REDD programmes offers a means to bring local and indigenous communities closer to government authorities, and an opportunity to demonstrate mutual will and trust. Similarly, REDD offers a chance for indigenous peoples to become fully integrated in formal forest management, while indigenous knowledge offers policy makers an opportunity to more effectively mitigate climate change. Adalberto Padilla summarized the workshop's conclusions: in all of the cases described, REDD is already causing both positive and negative impacts. Positive effects include the strengthening of indigenous institutions, promoting spaces for collaboration and participation in government processes, and also providing a platform for addressing indigenous territorial rights in accordance with international guidelines. If we do not implement REDD safeguards to their fullest extent, these rights are not being fully recognized. From indigenous people's perspectives, these safeguards should ensure FPIC, access to information, and equitable access and benefit sharing mechanisms, among other guarantees. It is clear that this is not always the case. Above all, he concluded, deforestation needs to be stopped, and REDD is a means to achieving that. There is a need to curb extractive industries that facilitate the destruction of forest cover, and end the perverse incentives that encourage this.